LUNATIK emerged from disruption. It was founded on taking risks, making the improbable possible and listening to the crowd. 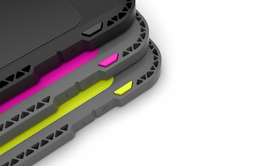 LUNATIK designs premium products that transform and enhance your mobile, digital life. We are obsessed, sometimes even crazy about everything we create. At LUNATIK, we look for — and find — unseen connections between materials, categories and experiences. That’s transformational design, making products that change the way people live and move. OUR STORY It is the dream of every designer not only to imagine products, but to build and sell them. LUNATIK burst into the spotlight in November, 2010 when designer Scott Wilson launched TikTok+LunaTik Watch Kits for the iPod nano on Kickstarter, long before the platform was widely utilized by designers. The TikTok project raised a record-breaking $1M in 30 days, launching LUNATIK as a global brand overnight and ‘kickstarting’ the DIY product development revolution.